Water bear. Coloured scanning electron micrograph (SEM) of a water bear (Paramacrobiotus craterlaki) in moss. Water bears (or tardigrades) are tiny invertebrates that live in aquatic and semi-aquatic habitats such as lichen and damp moss. Paramacrobiotus craterlaki is a carnivorous species that feeds on nematodes and rotifers. Water bears are found throughout the world, including regions of extreme temperature, such as hot springs, and extreme pressure, such as deep underwater. They can also survive the high levels of radiation and vacuum of space. Magnification: x330 when printed at 10 centimetres wide. Tardigrades, or water bears, are tough little creatures. They’re only half a millimeter long fully-grown, but they can live through almost anything: temperatures as low as -458 degrees Fahrenheit or as high as 300 degrees, pressures six times greater than those in the deepest ocean trenches, extraordinary amounts of radiation, even the vacuum of space. Last month, researchers in Japan published an analysis of the entire genome of one of the most resilient tardigrade species. 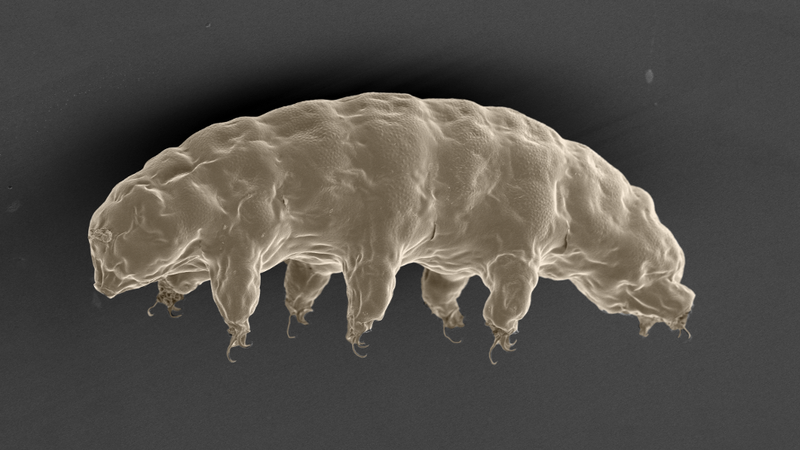 In the course of their research, geneticist Takekazu Kunieda and his colleagues from the University of Tokyo found some of the lucky genetic tricks that tardigrades have evolved to keep them safe in extreme environments. Because it is easier to study the processes happening in tardigrade cells when the genes are housed within mammalian cells, the researchers cultured human cells to produce bits of the tardigrade genome. Then, they could manipulate the cells to figure out which genes give the tiny animals their impressive resistance. One of the tardigrade’s best survival tricks is called cryptobiosis: basically, it’s an extreme form of hibernation where all of its metabolic functions stop almost entirely. When a tardigrade is in this state, suspended between life and death, it can survive almost anything. It can be dried out to 3% of its normal water content and come right back to life with just a splash of water. In living creatures, dehydration can wreak havoc among cells, even ripping apart DNA. Tardigrades, though, have a protein called Dsup which holds the DNA together under the stress of drying out. When Kunieda and his team discovered this protein in the tardigrade genome, they also found that it protects the DNA from radiation, particularly X-rays. “Tolerance against X-ray is thought to be a side-product of [the] animal’s adaption to severe dehydration,” said Kunieda. Not only did the researchers discover the protein that protects tardigrade DNA from desiccation and radiation, but they also were able to test that protein using their human cells with tardigrade genes. What they found was impressive: the human cells with Dsup were able to reduce X-ray damage by up to 40%.